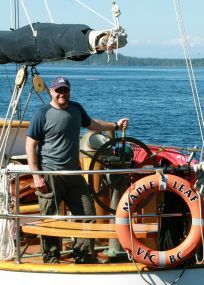 First mate and captain in training Brandon Harvey, talks about his career and current job with Maple Leaf Adventures, a company that offers nature tours along the British Columbia and Alaskan coastlines. Where are you from? Do you have a university degree? I am from Victoria, BC on Vancouver Island in beautiful British Columbia. I became fascinated by the marine environment and its inhabitants at an early age and have spent my entire working life spending as much time in that environment as I can. I really enjoy being on the water, educating guests about the species and ecology of marine systems, and sharing the wonders of the ocean in a safe and responsible manner. I have a diploma in Eco-adventure tourism, a BSc in Geography/Biology, and I am studying for my MSc in Environmental Management. Did you complete any maritime courses for licensing or certification prior to starting your job search? As a Canadian, I have completed the required certifications and exams for Transport Canada to receive my Master Limited 60-ton (passenger vessel). This included completing the marine emergency duties, radio operator course, and marine first aid. As the Canadian regulations changed, I have upgraded over the years to include my Small Vessel Operators and the Small Vessel Machinery Operators (Engineering) designation. These are completed through Transport Canada by written and oral exams after the required sea time is documented. After working for larger tour companies, I wanted to experience exploring marine environments with small select groups of passengers. When I was investigating working for Maple Leaf the attraction was exploring the wildest parts of the BC and Alaskan coast on a beautiful classic sailing vessel with guests who have specifically searched out that type of experience. The trips Maple Leaf run include traditional yachting aspects, like maintaining a high level of service, but ultimately we are about exploring and experiencing the wonders of each destination with an intimate group of guests and crew. From the beginning, it was clear the Maple Leaf family is as much about adventure, fun, and friendship as it is about pride in the vessel and the hospitality of the guests they host. Maple Leaf was also attractive as an employer because they have made the environment and conservation a top priority in the way they conduct their business.